5 Course Degustation Dinner with beer and wine to accompany each course. 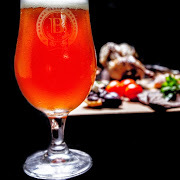 The brewer from Barossa Valley Brewing Company will be representing the various beers and Dr John Tomich will be the winemaker to illuminate the dinners on the benefits of each style of beverage for each course. A brewery tour precedes the dinner.